How does the server know if a command is valid and how does it know what parameters it should expect, if any? That is the where the WSDL chips in. In an effort to avoid overkill, we're going to take a look at a very, very, very basic WSDL file. These define the style and structure of a SOAP request. The message element informs the SOAP client and SOAP server what parameters it's expecting from the client and what parameters the server should return. This acts as a guide if you will for sending the data. In our now infamous common_get_disk_quota operation, you see there is no part child element for common_get_disk_quota_request. This means that the operation should receive no additional parameters, i.e. it will be invoked as common_get_disk_quota(). The other message element defined in the WSDL is "common_get_disk_quota_response". Looking at the part child element, we see first that it exists and it has an attribute called type. type just says how the parameter (or return value) should be rendered. It's xsd:struct, which means it should be treated as an array with multiple values. Most languages render xsd:struct types as hashes with a key => value notation. service elements contain several closely related ports and can be thought of almost as clases. They are there for the grouping only. ports are a more specific collection of operations. They contain child elements named operation with an attribute name. These values in the name attribute are the functions that you call directly from your SOAP client. input and output children simply refer to what message should be used in calling the operation. 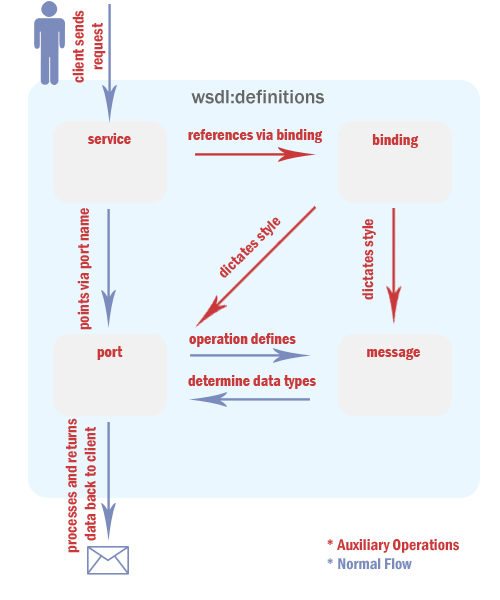 That's all you really need to know when deciphering a WSDL. Those three elements make up the essential information you need to know in order to write a script that successfully queries the SOAP server and retrieves the data. Of course you also see binding in the mix, but that merely dictates the style to be used during invocation  not essential for what you're trying to do. And that's all there is to esprit! Let's get to the fun stuff: authenticating and per-language implementations.